Given its potential to ignite the creative spark of an infinite number of narrative possibilities, a professor once told me that the only prompt a writer would ever need was to place two characters in a room together, wherein one wants to stay and the other desires to leave. Using this deceptively simple premise as a slow-burning jumping-off point roughly one hour into this character-driven mystery, in About Elly what begins in the same vein as Kasdan's The Big Chill morphs into something much closer to L'avventura by Antonioni. 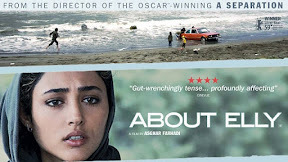 At its core a like-minded tale of two female friends bound together in a push/pull relationship, in this understated masterpiece, Oscar winning Iranian filmmaker Asghar Farhadi (A Separation) multiplies the aforementioned two individuals by two cars of people vacationing together on an ill-fated weekend by the sea. A haunting film of ambiguities bursting with secrets and lies, Elly makes clever use of foreshadowing both in its subtitled dialogue and classically composed cinematography that plays much better not only the second time around but also on a much larger screen. Daring to fill the frame with people as far as the eye can see (as opposed to methodically introducing its large cast of characters one-by-one), Elly respects our intelligence right from the start. Hoping to fix up her daughter's beautiful teacher with a recently divorced friend visiting from Germany, the scheming, if well-intentioned Sepideh tells a handful of white lies in order to see if love between her friends could potentially thrive. Without any idea just how badly her plan will go awry, Sepideh continues to push the two together after early excitement and exasperation gives way to a few false starts. A stranger in the midst of a tight-knit group, although Sepideh argues that "to know Elly is to love Elly," just how well anyone knows her (or one another for that matter) is suddenly brought to light when Elly vanishes in thin air after she's last seen (symbolism alert!) flying a kite. Deflecting guilt and suspicion over whether a woman chose to leave or was forced to stay, as the remaining characters begin turning on each other, secrets come tumbling out. Made in 2009 and finally released stateside in 2015, admittedly the quality of Netflix's About Elly stream does date the image slightly. 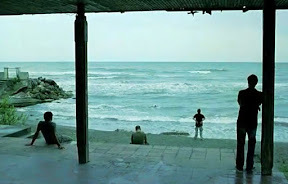 However, much like Farhadi's Douglas Sirkian inspired high gloss soap The Past, given the way that Elly draws upon everything from '40s women's weepies to existential Noir via Preminger's Laura (as well as its most overt inspiration of Antonioni), the aged look works for this instantly addictive and emotionally thrilling timeless tale. Produced supremely well and seemingly on the cheap, About Elly proves once again how little budget, A-listers, and effects matter when it comes to crafting a masterful work in any language. Even if it's as simple as the debate to stay or go (and just as my professor predicted nearly two decades ago), story is still king.